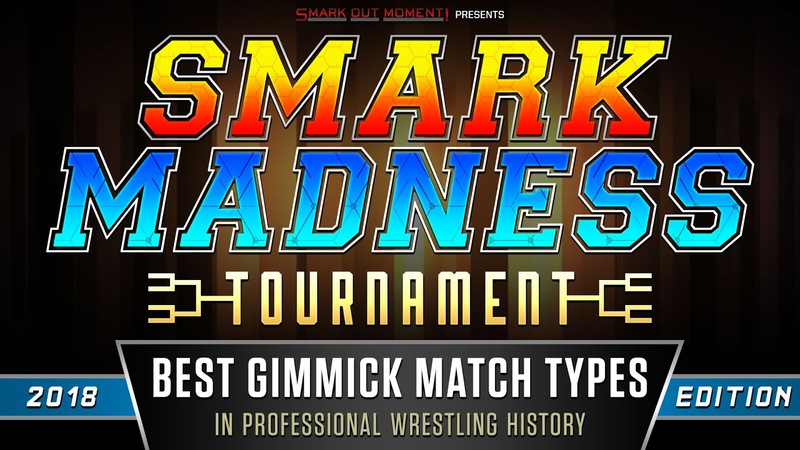 The 2018 SMARK MADNESS tournament has come to a close as you've decided what type of gimmick match stipulation is the best in the history of professional wrestling. A list of every type of match conceivable was compiled, with many of them being merged together based on similarities in order to fit a 32-seed bracket style, with pairings grouped based on theme. With that, you've declared the winner of this year's Smark Madness Tournament and the best professional wrestling gimmick match type in history to be the Battle Royal or Royal Rumble!! In Round 4, there was only one vote that separated Ladder Match defeating Elimination Chamber in a tight 24-23 poll with 51.1% of the votes going to Ladder Match. Just narrowly missing out on the closest call designation were two Round 2 matches that also were a difference of one vote, as the Iron Man Match scored 22 (51.2%) over Last Man Standing's 21 (48.8%). The same numbers applied to Falls Count anywhere scoring 22-21 over a standard Street Fight or No DQ match, no matter what you rename it. The overall widest margin in a single vote came in Round 3 when Elimination Chamber absolutely destroyed Steel Cage with a score of 34-1 ,earning 97.1% of the poll. In second place for the biggest landslide are two Round 1 votes, which saw the our two finalists of Battle Royal / Royal Rumble and Ladder Match both earning 53 votes (96.4%) to defeat Tornado Tag Team Match and Object on a Pole or Flag Match, which only received 2 votes a piece (3.6% of the poll). I didn't expect Falls Count Anywhere to struggle as much against a regular No DQ match, considering they're the same thing, but FCA has a bonus element to it. That should have been a more decisive victory in my mind. I also thought Hell in a Cell stood a better chance against WarGames, but maybe the latter is fresher in everyone's minds and received more votes that way. Buried Alive being the victor of that quartet of "take the wrestler and put them in something" was surprising to me, as I figured Casket Match would win, but it was knocked out first. Other than that, everything pretty much progressed the way I had anticipated, for the most part. If Elimination Chamber would have beaten Ladder Match, I wouldn't have been surprised, and that vote came down to the wire, even. Big thanks to everyone who participated in the voting from the qualifying round all the way up until the end, as well as those who shared this on Facebook, Twitter or elsewhere to draw more attention to it and get more people involved. If you have any suggestions of what you'd like to see happen in the 2019 tournament or ideas of how we can improve this, make sure to leave us a comment or shoot us an email to send that message our way!